Following on from the success of the 2013 series Afterlife with Archie, Archie Comics are continuing their re-invention of classic characters by tackling another much loved franchise: Sabrina the Teenage Witch. One thing I should point out right now is that I have never read an Archie Comic before. Many of the names and settings are quite foreign to me and I am all but unfamiliar with most of the storylines that have featured through the 70 year history of the publisher. Having said that, this first issue is a perfect jumping on point as it lays out all that you need to know about this character and her past. Fans of the perennial TV series starring Melissa Joan Hart will be right at home with this book and won’t need much information to be able to get on board. In the same fashion as Afterlife with Archie, writer Roberto Aguirre-Sacasa dispenses with the lighthearted aspects of the character and delves straight into the macabre side of witchcraft. Sabrina is born to a mortal mother and a warlock father which is forbidden by the laws of magic and forces Sabrina’s’ father, Edward, to incarcerate his wife in order to protect his secret. Sabrina is then placed in the protection of her two aunts, Hilda & Zelda and effectively exiled for her own protection. As Sabrina develops, her latent powers as a witch become even more powerful and she and her aunts are forced to move in order to allow Sabrina to develop without the intrusion of other covens. While the story does a great job of sticking to the origin of the character, it also flourishes in the exploration of the darker elements of witchcraft. Hilda, Zelda and Edward all engage in some pretty questionable acts and even Sabrina herself has some morally ambiguous moments in this issue. Robert Hack does a sterling job on art duties for this book. His style perfectly accentuates the different time periods in which this book takes place. The look and overall design of the characters and settings maintains a real world interpretation of this universe, but it also revels in the blood and gore of the darker side of witchcraft. There is a real gothic feel to this book and the choice of colours help to reinforce this throughout. The muted pallet of mostly yellow, grey and read is used to great effect to convey moments of happiness and pure dread. Don’t let the name put you off. Chilling Adventures of Sabrina is a book that wants you to take it seriously. It should appeal to fans of Archie comics and horror comics alike. Parental Concern: Moderate. This is definitely not the Sabrina you remember from the 90’s TV show. Great Job! Thanks for taking the time to write this review, I enjoyed it! I’m much like you in that I don’t follow Archie and until recently have never read an issue. Although I still don’t read from the normal Archie universe, the crazy spin-off’s have been great! Along with Chilling Adventures of Sabrina, I really enjoyed: Afterlife with Archie, Archie Vs. Predator, Archie Vs. Sharknado, Archie Meets the Punisher, and Archie Meets Kiss. I have looked at the normal Archie books and though they are well written and inked, they aren’t for me. 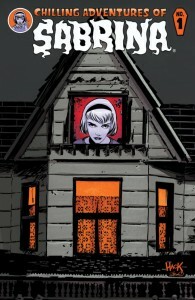 I found it interesting that the first issue of Chilling Sabrina was released under “Archie comics.” Then, after a 6 month hiatus, issue 2 (and on), were released under “Archie Horror.” Though they’ve only released Afterlife With Archie & 3/4th of Chilling Sabrina, Archie Horror to date has an impeccable run. I can’t wait to see what they do next! Also.. I’m not ashamed to admit that I watched Sabrina in the 90’s! I had such a crush on Melissa Joan Hart!